It starts with a microphone and some static. Jodee Mundy is a hearing person born into a deaf family, so when she comes to the front of the stage and directs this microphone towards different sections of the audience – with beautifully expressive sad faces every time the sound moves away from us, and “she gets it” affirmations whenever it moves towards us – the deeper resonances are immediately clear. Sound is not an absolute means of communication, but the concept of sound is universal. Mundy is a Coda, which is simply an acronym for Child of Deaf Adults, but also much more. In music, which can be seen as the pinnacle of sound, a coda is best understood as a close or culmination to a piece or a movement. 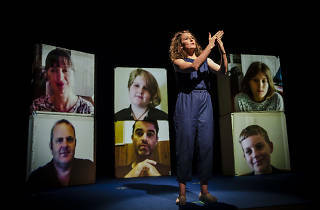 It’s an extremely complex and tricky moniker when applied to the hearing offspring of deaf parents, not least because it implies a rounding off or perfecting of deafness – there’s a whirlwind of associations inherent in the term that goes some way to describing the uneasy position Codas occupy in the deaf community. Personal is precisely what it says on the packet: an idiosyncratic account of a particular social identity, simultaneously unique and representative. It’s evident that Codas will find heaps to identify with, but it’s also highly informative and moving for the rest of us. Mundy employs a variety of techniques to draw us into her world, and expertly delivers on her pact with the audience. It’s that rarest of things: a lean, punchy show that could easily accommodate more content. There’s a delightful sense of the analogue about the play, even while it dazzles technically (the sound design by Madeleine Flynn and Tim Humphrey, and the video design by Rhian Hinkley are second to none). A long opening section involves soundless Super 8 footage of Mundy’s family projected onto cardboard boxes. At first, it looks like footage every family would take; only gradually do we get a sense that this family is different, as mum and dad sign happy birthday, for example. Later, we get footage of Mundy and her primary school teacher conducting an interview about the peculiar technologies that help her parents function in the modern world: doorbells connected to lights, and typewriters connected to telephones. All of this is adorably daggy, as Mundy silently acknowledges, but it contains some hints of sadness too. Functioning as a bridge between the deaf and hearing worlds isn’t an easy or looked-for role for a young person, especially a very young person. 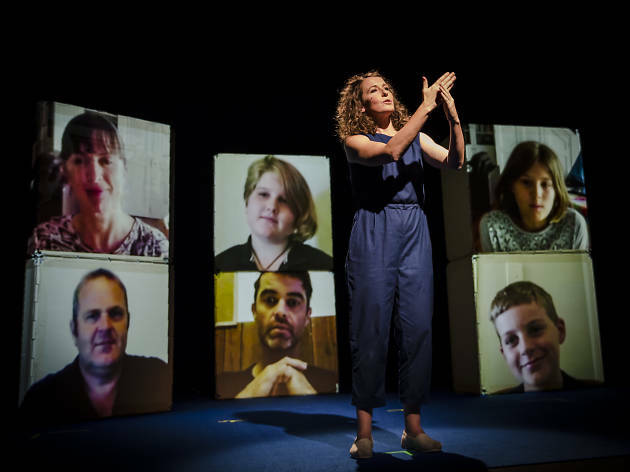 A Skype conversation with her deaf brother Gavin reveals the extent of her parents’ needs; as a four-year old Mundy is co-opted into the role of translator for complex and age inappropriate transactions. When she asks him how he thinks this impacted on her personality, he simply says, “it made you a better translator”. It’s an observation both revealing and true; Mundy is a beautiful translator, crossing back and forth between the worlds of the hearing and the hearing impaired with consummate ease. There are sections of the play that are totally dependent on sound, and sections that one has to be proficient in Auslan to understand. She always signs before she speaks, and sometimes she doesn’t translate at all, which is the most eloquent way of realigning priorities. While she is standing in for a whole community, she never comes across as more than representative of her own experience. Anthony Burgess said that all translation is degrees of loss, but Mundy gives the impression that we are gaining something by speaking without words. Some sections need work. A gorgeous moment of sharing – funny, relatable vignettes about growing up with deaf parents – is interrupted by long and unnecessary pauses. There’s a kind of slapdash approach to structure and pacing. And there’s a sense that, while we get touches of poignancy, emotionally we’re only scratching the surface of complex issues around access and communication. But none of that matters much, because the overall effect is utterly delightful. Rather like Jess Thom’s Backstage in Biscuit Land, Jodee Mundy’s Personal is a winning and inclusive tonic, consistently hilarious and informative.